Two crucial skills are not sufficiently taught in most schools, personal finances and emotional intelligence. Most days one has to engage with money and other people, clearly both are fundamental to a person’s well-being. How do you relate to people? How do you manage money? 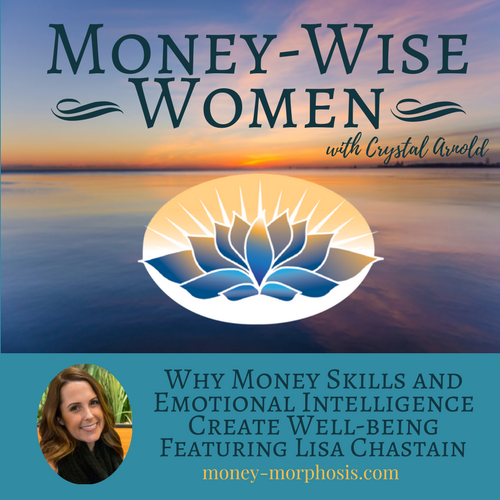 “Money-Wise Women” guest Lisa Chastain is a transformational coach who works primarily with millennial women. She sees the incredible potential in the emergent generation, and gives them the practical skills to manage their money, as well as the emotional intelligence to relate to people more effectively. With a background in the financial industry coupled with extensive training in Emotional Intelligence, Lisa has developed a unique blend of rational and intuitive skills. She is well versed in financial lingo and teaches practical steps to save more, spend less, and invest in the future. We discuss why women in the emerging generations are building their financial legacy now. We agree about the importance of mentorship and intergenerational wisdom exchange. Encouraging the younger generations to step into leadership roles and understanding their needs and concerns is a crucial aspect of developing true wealth. Too many youth are feeling crushed by their student loan debt, and as Lisa observes, its usually not as horrible as they imagine. Lisa gives two key pieces of advice for women wanting to transition from a job into entrepreneurial endeavors. We discuss the growth that happens at the edge of our comfort zone as we expand. When we acknowledge how struggles bring gifts and insights that can be used in service of others. Know what you most value and why is becoming increasingly important in a world flooded with information and polarizing opinions. Lisa supports women to develop their leadership skills by communicating their “why” more effectively. “Find your voice about what is most important in your life. Find a tribe of people and communicate regularly with them about what’s important for you.” We discuss the power of aligning your values with your financial flows through tithing, gifting, and charity. Lisa describes her unique model of transformational coaching as the best way to move from personal discovery to creating the results you desire in life. Using her 5A model, she keeps clients in action and accountable. The five A’s are: awareness, acceptance, alignment, action, and accountability. We have both experienced the amplified power of women coming together to be vulnerable and support one another as entrepreneurs. Lisa describes her Sisterhood program that is beginning this month; and the importance of moving into action with the support of a group. I have personally seen the relief in hundreds of women who have had major breakthroughs within a supportive group workshop. These are most effectively integrated into daily life with a support group. Because money is taboo to talk about, there is a lot of energy bound up in hiding the truth from ourselves and others. Playing it small behind a fog of shame may feel comfortable, but authenticity is much more satisfying. Take a step towards greater emotional intelligence and hone your financial skills. Because when we take responsibility for what is most valuable to us, then we become powerful feminine leaders.